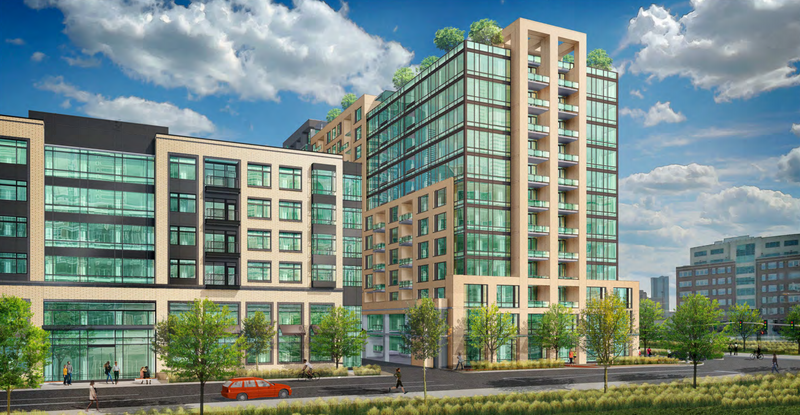 Greystar, a developer out of Charleston, South Carolina, wants to build a 14-story apartment tower across the street from Denver’s most important transit hub. With a name like Ascent at Union Station, you’d think its builders would reach for high standards, but you’d be wrong. That’s because the developers have baked almost two parking spaces per unit into the initial design — and more than one parking space per bedroom. At 19th and Wewatta. A one-minute walk from Union Station. In a planning zone with no parking minimum. When fully built out, this area should be one of the most walkable places in Colorado. Building a lot of space to store cars will do the opposite: Encourage conflicts with people walking and biking, and generate traffic to discourage walking, biking, and transit. For comparison, let’s take a look at the parking ratios of some of the other residential developments in the Union Station area. Please note: parking spaces dedicated to retail uses are not included in the totals below. Not only is Ascent Union Station’s proposed parking ratio significantly higher than any of its neighbors, including its sister property Elan Union Station, but it is significantly higher than other downtown apartment projects that don’t have the benefit of being located directly across the street from the region’s largest transit hub. For example, the parking ratio for One City Block = 1.23, Broadstone RiNo = 1.35, and SkyHouse Denver = 1.36. The three primary defining characteristics of great urban spaces and downtowns in particular are density, mixed uses, and a pedestrian-prioritized public realm. Incorporating such a high number of vehicle parking spaces into a project located in what is arguably the most pedestrian/transit-focused place in the entire region is bad urbanism. I hope Greystar will reconsider their parking plans for Ascent Union Station. Schroeppel suggests nixing 68 parking spots that take up the entire second floor and replacing them with 13 residential units. If Greystar does change its course, it would have to be on its own accord. The conceptual design cleared the Denver Planning Board last week. Denver likes to talk a good talk about urban planning. In reality…the government is riddled with 1950’s car lovers. Two steps forward one step back. While I appreciate Denver’s dynamic minimum parking requirements, they also need maximum allowed parking too. On the other hand, maybe they will rent out spaces to downtown office workers or other people who need parking. I’m not a big fan of parking minimums or maximums in downtown areas.